This past week we were at the beach and I didn’t bring a book… Well… intentionally didn’t bring a book with me… shocked? This may change that! 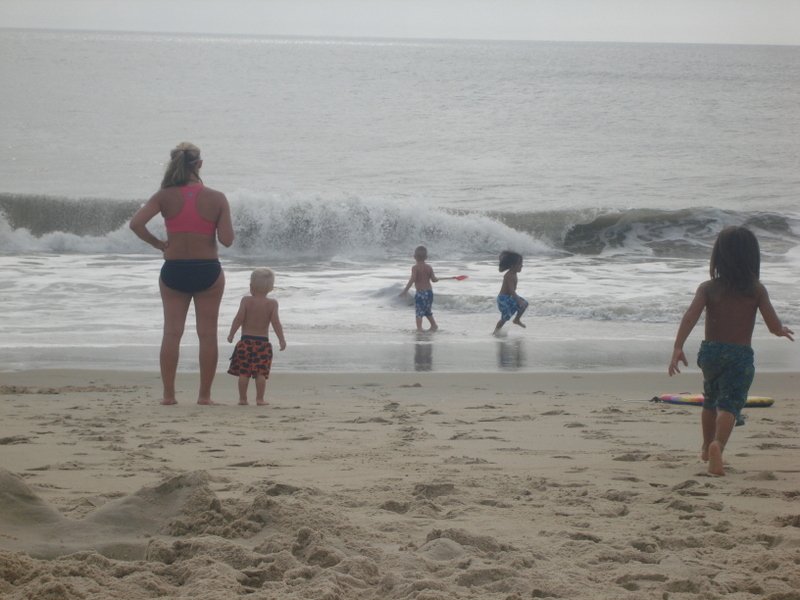 I went with my three kids (aged 5, 3 and 1) and my sister and her “three kids” (4,2 and she is 8 months pregnant)! The hubbies had to work, so it was just the two of us with a daycare! So, needless to say I didn’t think I’d get much time to read, and I was pretty much right. It was funny to go down on the beach and watch the reaction of people around us. Two women and one of them VERY pregnant with a row of ducklings following behind – 5 kids 5 and under!! The elevator was the best! People thought they were getting a quiet ride until our entourage got in! It definitely wasn’t quiet then! It was a lot of work, but once we were down on the beach it was fantastic… the kids needed NO entertaining, we just had to watch them at the ocean’s edge! But… once they were all tucked in at night my sister and I stayed up talking, but we also wanted some quiet to read a bit as well… and I didn’t bring a thing! Thankfully my mother (who was there the first day, but then left to go home) left me with a book. It wasn’t on my reading list, but it was a short quick read and quite interesting. It isn’t as good or as well written as [amazon_link id=”074324754X” target=”_blank” container=”” container_class=”” ]The Glass Castle[/amazon_link], but I would definitely put the two in the same category! The authors are two daughters writing about their father who was a career criminal.. in and out of jail his whole life and involved with a bad group of people in Youngstown, West Virginia. He never seemed to be able to rid himself of the bad company even though he loved his kids and really wanted to be there for them each time he was paroled. It is amazing that two of his daughters (he had two other children with his first marriage and then two additional children with other women) were able to secure jobs with the CIA and currently live and work in the Washington DC Metropolotan area. Their mother worked hard to raise them so that they didn’t follow in their father’s footsteps. I probably finished this book in less than 5 hours, so it was super quick and easy and hard to put down. I just HAD to know what happened next. The penmanship certainly isn’t what draws your attention. The content is so unbelievable.. to think people live like this… unreal! I definitely think there are better books to read, but I’m glad I had a simple read for the beach that I was able to finish before coming home and back to a whole stack of books that I’m currently reading and haven’t gotten through! If you’ve read this let me know what you think!